Like it or not, your project needs management. Yet few good software projects can survive bad management. 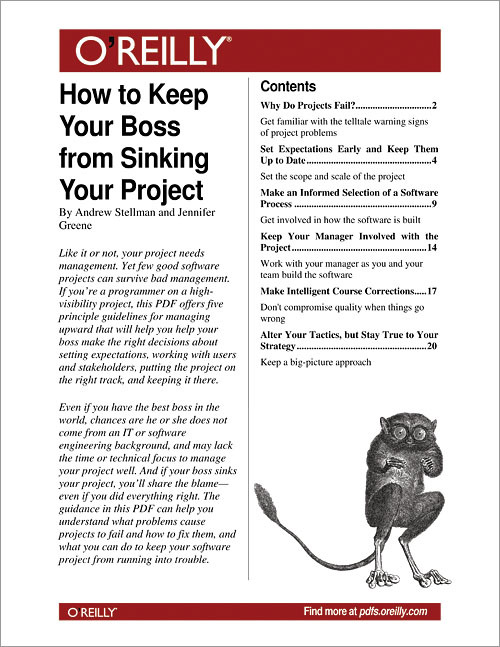 If you're a programmer on a high-visibility project, this PDF offers five principle guidelines for managing upward that will help you help your boss make the right decisions about setting project expectations, working with users and stakeholders, putting the project on the right track, and keeping it there. Even if you have the best boss in the world, chances are he or she does not come from an IT or software engineering background, and may lack the time or technical focus to manage your project well. And if your boss sinks your project, you'll share the blame-even if you did everything right. The guidance in this document can help you understand what problems cause projects to fail and how to fix them, and what you can do to keep your software project from running into trouble.